Horror fans love autographs. Some of them travel half-way across the country to conventions just for the privilege of standing in line for hours on end so that they can pay $25 for an illegible scribble from someone they don't even know. If you've missed all the horror conventions and have no money anyway, you can surprise everyone with the following gift for only a couple of dollars. 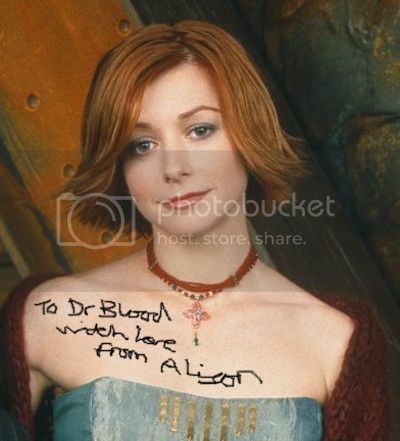 Not signed by Alyson Hannigan obviously. 7. A picture frame (optional). 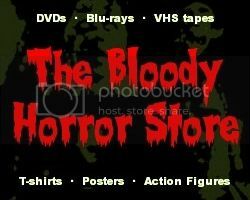 Download a picture of your (or your horror fan's) favourite celebrity. Print out the picture on photograph quality paper. Look through the phone book for someone with the same name as the celebrity whose photograph you have printed out. Write down his or her address. Note: You can save a lot of time if you already know someone who shares the same name as a celebrity. Just the first name will do in most cases. Go to the person's house, knock on the door or ring the bell, tell them what you are doing, and politely ask them if they will sign your photograph. If you are really nice, they will probably personalise it for you too, thus devaluing it as much as a "real" celebrity autograph. Frame the now autographed photograph, and wrap it up in pretty Christmas paper for your horror fan. Once it's up on his bedroom wall, he will never know the difference nor will anyone else who even cares. Nobody will ever see it anyway.